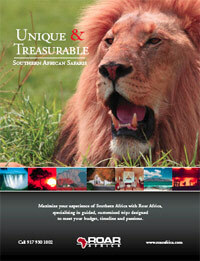 Roar Africa answers the call of honeymoon travelers looking for more than just a pre-packaged tour in Africa. The father-and-daughter boutique trip planning company creates individual experiences built around a person’s style, taste and pocketbook. Honeymooners can choose to discover the bush on elephant back, taste award winning wines, or see wildlife from a floating hot air balloon. Whatever or wherever the journey may lead, Roar Africa knows the right ingredients that make clients fall in love with Africa over and over again. Even the extra unexpected touches – candle light dinners in the bush, dining in a private wine cellar, or making a toast with a fine glass of South African wine while whale watching – create memories to share forever, to tell to friends and family. Expert guides are also on hand to season the trip with the know-how to let travelers discover the country on their own.